June 13, 1861: The Third Michigan leaves Cantonment Anderson, south of Grand Rapids for Detroit. They leave with 1,040 men in ten companies. June 16, 1861: The Third Michigan arrives in Washington City. July 1, 1861: The Third suffers it's first casualty. William Choates of Company C dies of fever. July 18, 1861: The Third comes under fire at Blackburn's Ford during the First Battle of Bull Run. July 21, 1861: The Third assists in covering the retreat after the Battle of Bull Run. 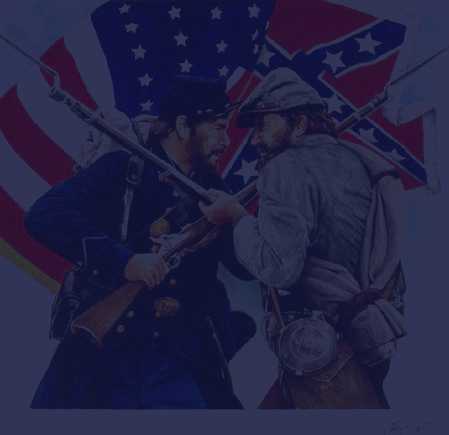 May 5, 1862: The Third assists in driving back a Confederate counterattack at the Battle of Williamsburg. One of the volunteers was a young clerk in a Lansing dry goods store named Charles T. Foster. His younger brother, Seymour, remembering Charles many years after the war, described him as about five feet ten inches in height, with a light complexion, big blue eyes, and a high forehead. He was a fine singer, a member of the church choir, had a genial disposition and agreeable manner and was a great comfort to his widowed mother. He wore a very becoming young mustache. Charles had attended a mass rally at the old capitol in Lansing the day after the attack on Fort Sumter. The House chamber was packed. Cheer after cheer and speech after fiery speech filled the air in the packed hall and then a call for volunteers to fight to save the Union. Not a soul moved. Then Seymour, who had not been able to get into the packed hall and had climbed up and perched in one of the windows, saw that someone was working his way to the head of the crowd. He couldn’t see who it was. Suddenly, a voice rang out: “Charles T. Foster tenders his services and his life if need be to his country and his flag.” Charles had just become the Lansing area’s first volunteer. But since there were no regiments forming in Lansing, he had to go to Grand Rapids to join. 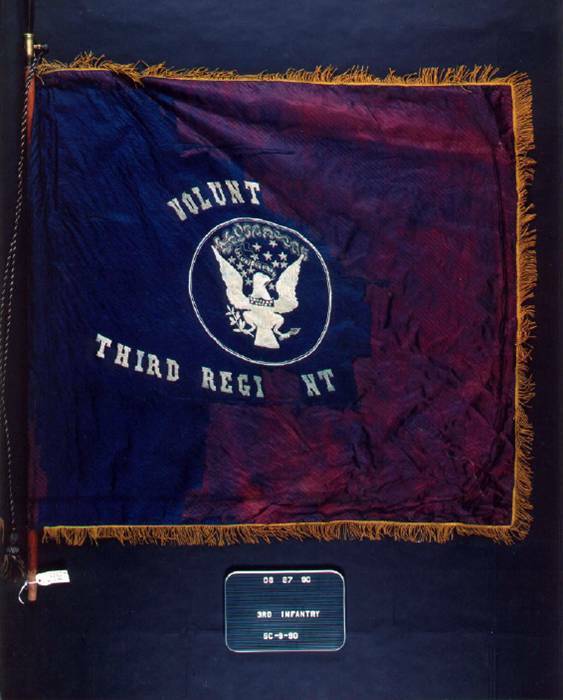 On June 4, 1861—just before the regiment left for battle—a vast assemblage of people—at least 4,000—gathered at the Third’s training camp on the outskirts of GR to watch a moving ceremony in which 34 young women, representing the states of the Union, presented the regiment with a beautiful silken banner. 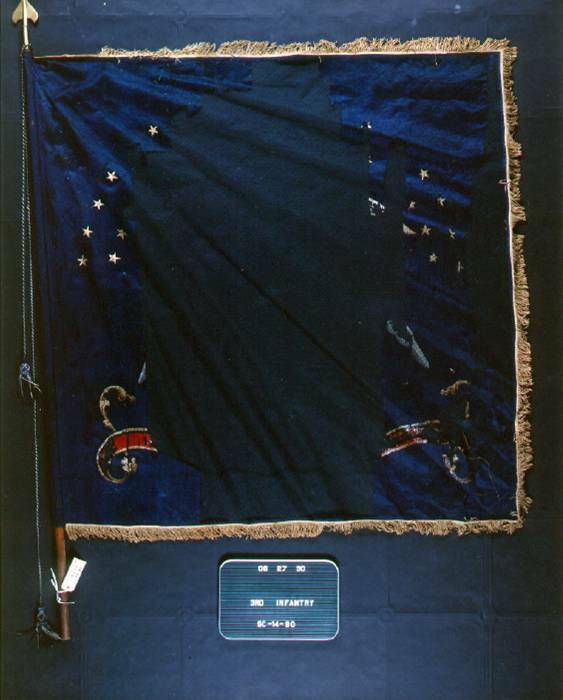 “The flag is of the army size, six feet on the pike and six feet six inches on the fly, of blue silk, with heavy yellow fringe, and on the front is elegantly embroidered in corn-colored silk, the arms of the United States and the words “Volunteers, Third Regiment, Mich.” surrounding the arms. Carriages brought the 34 girls to the camp, as well as a huge cavalcade of spectators, a brass band, and a glee club. Six girls—including (of course) Rebecca—presented the flag to the regiment. Rebecca’s diary tells us that the girls wore blue dresses with red and white sashes, and carried blue parasols with 13 gold stars. The other girls wore red Zouave jackets and brown jockey hats trimmed with red, white and blue. Then three cheers for the “Ladies of Grand Rapids” and three cheers for the flag. A few days later, Rebecca recorded in her diary: “June 13—one of the saddest days in the records of Grand Rapids. Our pet regiment, the Third, has departed at last and left many, many sorrowing hearts.” As the regiment marched away, thousands waved handkerchiefs and young girls showered the troops with bouquets. There was no time to mourn her. On July 18, 1861, the regiment was plunged into battle at Blackburn’s Ford and—only a few days later on July 21—they were at Bull Run. Charles’s brother Seymour recalled that Charles never knew the grief his letter caused their mother, particularly his statement that he would not be missed. 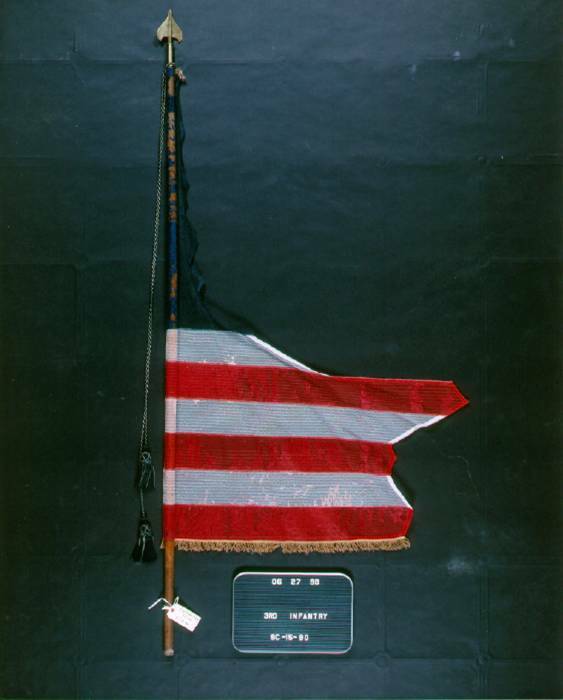 The flag was kept by the “Old Third” for years after the war—displayed at regimental reunions and carried in 4th of July parades—until 1882, when the decision was made to finally part with it. The Grand Rapids Democrat noted that it was by then “in rags and a perfect wreck, being much more tattered now than when sent home from the war in 1863, and then it was shot in pieces.” It would be forwarded to Lansing to join the other battle flags in the Capitol, but, before it went, the “old boys” gave three hearty cheers for the Ladies of Grand Rapids—just as they had done 21 years before—and observed a moment of silence for Maggie Ferguson. Benjamin Morse will win the Congressional Medal of Honor for capturing a stand of colors during this engagement. 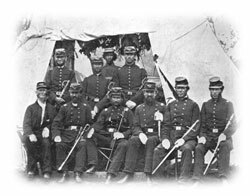 Upon the Third's muster-out on June 10, 1864, its remaining men became Companies A, E, I, and F of the 5th Michigan Infantry. As such, they served through the siege of Petersburg, three battles of Hatcher's Run, and the pursuit of Lee's Army to Appomattox Courthouse.